So… if you didn’t crack open the champagne yesterday, you can still celebrate today by getting your DNA tested… at some limited but still cool sales for the 2015 DNA Day. At AncestryDNA, for US testers, the usual price of $99 for an autosomal DNA kit has been reduced to $79 until 11:59 p.m. Monday, April 27th. Shipping is extra. I hear tell that the £99 price for a test kit in the United Kingdom and Ireland is also down to £79 for this sale, but can’t confirm it because I can’t figure out how to convince Ancestry’s web servers not to automatically insist that I access through the .com site instead of the .uk site, so you’re on your own on that one. 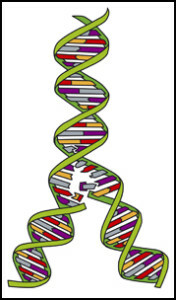 At Family Tree DNA, the big push is for the Big Y — the just-about-everything-you-might-ever-want-to-know test for the direct paternal linme. Got to have a male for this test and it focuses less on how we group men together as part of genealogical families and more on how we tease them apart into twigs at the ends of branches of the human family tree. So the sale at Family Tree DNA is on the Big Y test — use coupon code DNADayBigY to take $100 off Big Y; the coupon is valid through 11:59 PM 4/30/2015, and since Family Tree DNA is in Texas, that’s likely Central Time. And for whatever reason it doesn’t appear that 23andMe is playing along with a sale at all this DNA Day. Nothing on its website, nothing on its Facebook page. So the usual $99 price for a test kit is in effect there today. Not as good a group of offers as we’ve seen in the past, but still not anything to sneeze at so… come on and sale away into the world of genetic genealogy. Get your DNA tested. Remember that it is ONLY for the Big Y test, and I think you have to already have (or also order) a basic YDNA test to get the Big Y. Yes, that is their usual pricing. I went to town with this sale. Got kits for all my parents’ siblings, as well as a couple of their 1st cousins. I’m so excited! I have been wondering, though, about the ftdna sales. Have you ever noticed the myheritage.com page that has links to ftdna? The one that had piqued my curiosity the most is a mtdna full sequence + a “free” family finder autosomal, all for 199 or 198. I’ve seen it there for a few weeks at least, yet I’ve never seen it mentioned on any genealogy blogs. Is it not as great of a deal as it seems to me? I don’t even use my heritage, so I have no ties there, but I assume anyone could use the link. Haven’t tried it yet, though. I should have mentioned that the kits I purchased were from Ancestry (primarily because my first round of kits were Ancestry, and I want them to match as perfectly as possible when I compare segments at ftdna and gedmatch). But I am curious about what you think of the myheritage related ftdna combo I mentioned. From my (more limited) experience, the cheapest autosomal sale I have seen and the cheapest mtdna fs test I have seen (including coupons), added together, would still be a good bit more than the combo I mentioned.